I’ve been trying for years to write something about my mother’s bench in the waiting room at Union Station in Chicago. The bench where she sat and waited the day my father got home from World War II (his train was late). The bench she began to revisit when, 44 years and nine children later, he died. I’ve been trying to write about the two of them and that moment that day at that bench, but everything keeps sliding out of focus. Nothing holds still long enough for me to capture it. One hundred-thousand passengers and 700 trains passed through Union Station every day during the wa-r-one million people every 10 days, three million a month, 36 million a year. So many arrivals and departures. So many lives headed in so many directions. So many little stories and moments like my parents’. The waiting room is enormous. It seems to have been built to house Chicago’s early-20th-century ego. Standing there, looking around, any true child of Chicago is left to marvel not just at the city’s big brash ego but at the killing whoever sold the builders all that marble and glass must have made (not to mention the big brash bribes he had to pay to get the marble and glass contracts in the first place). They razed half the station years ago, but the scale of the designer’s vision endures. Even now, with daily arrivals and departures down to a trickle, Union Station will soar for you, if you sit there and let it. Most of the ticket windows and virtually all of the concession areas and alcoves have been sealed off, but, 125 feet overhead, the original skylight still produces a suffused, all-day twilight. The glass is a bit more pigeon-spattered, and the new, taller buildings nearby steal more of the sunlight. Still, sitting there, looking up, you get the idea. You sense the grandeur. Ninety years of foot traffic have worn swales into the white marble stairs that descend from street level to the waiting-room floor. And there are the benches, including my mother’s, rank upon rank of them–long, solid, empty, waiting for the glory days to return. It’s a good place to sit and contemplate your enigmas. You can sense generations of ghosts bustling by, perpetually arriving and departing in that twilight. You can feel their energy still roiling. This is a place you can conjure with. My mother had a complex, rational, and extremely precise mind. She put herself through teacher’s college by the time she was 18 and the University of Chicago by the time she was 24. She self-consciously dismissed her trips to their bench as “sentimental journeys.” I think she was embarrassed to give in to something as simple and maudlin as her love for that moment in August of 1944 when, gaunt, war-weary, and wounded, the young man she’d been waiting almost three years to marry was suddenly, safely, and finally there. He’d spent nearly two years as an infantry scout in the jungles of New Guinea. He’d seen combat. A lot of combat. He’d contracted dengue and malaria. Like every other man in his outfit, he’d expected to die fighting. In May of 1944 he was wounded severely enough to get shipped home and discharged. 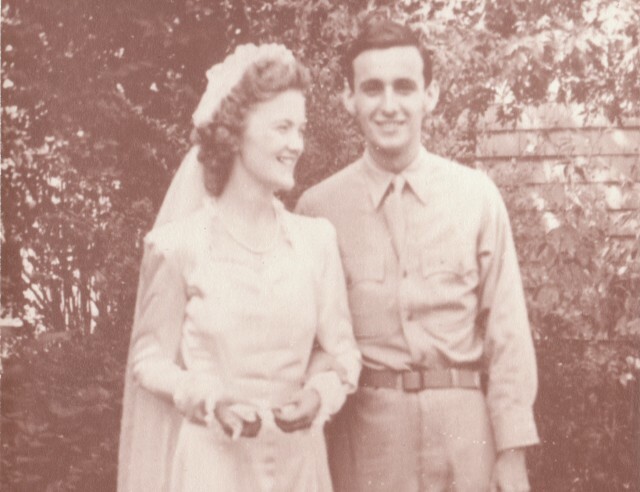 Standing there at Union Station three months later, looking at the love of his life, he’d weighed less than 100 pounds and counted himself the luckiest man in the world. She made her journeys alone well into her eighties, but last year, on the 66th anniversary of the day, my sons and I went with her. She was 92. I don’t think it was an especially successful trip. Her feelings about the man, their moment, and the place were far too private and subtle for her to express to the phalanx of hulking, less-than-subtle, testosterone-addled descendants who’d accompanied her. So we sat there on her bench. The enormous room, empty and quiet, echoed the way empty enormous rooms always do. Their small moment was still there, just out of her reach. After a while, we took a cab across the Loop, had lunch, then cabbed back to Union Station and caught the train home. It was to be her last sentimental journey. She died in February. When the weather turned nice in early May, we buried her ashes with his. This time he’d had to wait for her. The first few returning birds attended. A quarter mile to the east, truck tires sang on the Tri-State. The cemetery crew waited nearby. Everyone who had something to say had an opportunity to say it. When we were finished, we hugged one another and left. I haven’t visited her bench since she died, and that’s probably for the best. I would just be intruding. It was her journey, and their moment–just one among millions that have taken place in that room. So I’ll leave them there and leave the story at that before everything slips out of focus again. Yes. Probably for the best. And besides–I’ve acquired a few small moments and sentimental journeys of my own. Peter Smith is a Minneapolis-based writer and radio commentator, and author of two books, A Porch Sofa Almanac and A Cavalcade of Lesser Horrors. *Photo courtesy of Peter Smith.